If you’re considering a big move, Miami may be a city that’s on your radar. The beautiful beaches and happening nightlife make this a destination that visitors flock to from around the world. Like any city, living in Miami has both its pros and cons. The experts at MovingAddresses.org want all residents to make informed decisions about the new cities they decide to pack up and move to before taking the leap. That’s why we’ve compiled a list of the pros and cons of living in Miami. Review these features of the city before you start packing your swimsuit and sunglasses, so you can be sure this move is right for you. Pro: There are watersports and ocean activities galore – If you love to engage in watersports, Miami living may be the best kind of living for you. The city sits on a beautiful coastline and is rampant with jet skiing, boating, fishing, surfing, kayaking and paddle boarding. If you opt to live on the coast in Miami, you can find yourself wrapped up in a water sport, or just bathing in the ocean whenever you have the free time. The team at MovingAddresses.org recommends looking into the cost of these watersports if you plan to engage in them frequently. Renting or buying equipment can be a large expense that you should be prepared for before you make the move. Con: There’s an excessive amount of traffic and tourists – Miami is a busy city and one of the top vacation destinations in the world. This is great if you want to entice your friends and family members to come visit you after you move, but keep in mind, you’ll also be dealing with crowded streets and an onslaught of traffic when it’s the busy season for these tourists. Getting around in your own city when it’s this crowded can be frustrating for locals. Pro: There are beautiful beaches to explore. Beaches and palm trees are everywhere in Miami. The city offers a scenic sidewalk along its most famous beach, South Beach, so you can observe the white sand and bright blue ocean while strolling. 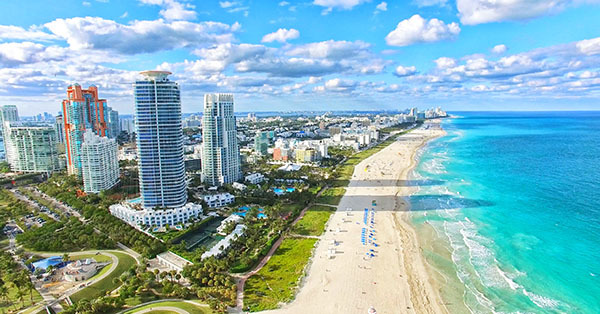 If the beach is one of the main reasons you’re considering Miami as your next home town, the experts at MovingAddresses.org recommend looking into condominiums and rentals on the shoreline, or close enough to walk to or to ride a bicycle. Driving to the beach and parking your car can get expensive if you must do it frequently for beach access. Con: The dining and shopping can get expensive – As a tourist destination, Miami shops and restaurants can get pricey. There are alternative options for locals, but many of the privately-owned merchants and dining facilities have pricey options that can be a turnoff if you’re a resident of the area. It can take some time and experience in Miami to learn which shops and restaurants are worth these higher prices, and which ones to stay away from. Pro: There’s a plethora of energetic nightlife – The downtown Miami nightlife is world famous for its energy and sophistication. Many world-renowned musical acts and DJs are known to perform in the city frequently because of the exclusive and fun late-night scene. The team at MovingAddresses.org suggests visiting the local hotels in South Beach if you’re looking for beautifully designed nightclubs and sharp-dressed locals. The hotel clubs and restaurants are some of the best places to eat and stop for a drink after sunset. Con: The city has a high cost of living – Whether you’re thinking of moving to downtown Miami or into a neighborhood on the outskirts of town, the city is known for its high cost of living. Real estate in Miami is usually priced higher than in the rest of the country, especially if you’re considering beachfront or downtown properties. The higher cost of living can also be seen with local dining and shopping. Monthly necessities like car insurance and utilities are also known to be a bit pricier than other areas in the state of Florida. Before taking the leap and moving to Miami, the experts at MovingAddresses.org suggest researching the cost of living, including groceries and insurance, to ensure you’ll be financially comfortable living there.